Cathy's Card Spot: Blended crackle background. Peacock Feathers, Blueprint Sketch and Ground Espresso. Tammy has some amazing combinations that look great together! The background Stamp is one I've had for ages and this is it's first inking! So I'm entering Darnell's latest NBUS challenge where using your never before used schtuff is all the go! 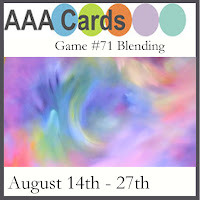 At AAA Cards the theme is blending. Simon Says Stamp Monday has a Go Fish theme. I'm hoping starfish and seahorses count as fish! Impression Obsession craquelure stamp; versafine ink & clear ep; distress inks; Sizzix mini sand and sea die; versamark ink; aged taupe and aged aqua frantage embossing enamel; sentiment sticker. Cathy beautiful card, love that crackle effect. That's one spectacularly gorgeous card, love it! Thanks for playing at AAA Cards. That blend of colors is beautiful. Love the starfish and seahorse. This is such an elegant and wonderful card with that gorgeous colored background! What a perfect backdrop for that pretty seahorse and the starfish! Such a beautiful card!! The inking is perfect and the crackles and embossing adds so much to the card. Thank you so much for sharing with us at the Simon Says Stamp Monday Challenge Blog!! wow this caught my eye in the NBUS challenge, it is so beautiful and I loved the crackling. I think it would also fit the peacock feather colour challenge here http://simplylessismoore.blogspot.co.uk/ you can combine with five challenges so you would be ok.